Hi again, I am back yet with another card. This time I took on the Global Design Project sketch as a challenge and once again I am using Stampin Up stamps. This set is called Petal Palette and I also used a little butterfly and a border from the Butterfly Basics set. I cut an A2 size card base from Melon Mambo card stock. Next I cut a smaller size water color paper panel and painted with pink and splattered some gold paint on it, too. I also stamped a cute border stamp from the Butterfly Basics set using Tip Top Taupe ink and tied a thin jute right above it and adhered it to my card base. Next I die cut an oval shape using Pool Party card stock and layered onto my card water colored card front using pop dots. Next I stamped my flower image onto watercolor card stock and painted it in and cut it out and once again using pop dots I added it to my oval shape. Next I stamped the little butterfly, cut it out and added it to my flowers. Finally I white embossed the sentiment to black card stock, cut it out and adhered it to my floral panel. Here is the sketch I was using. 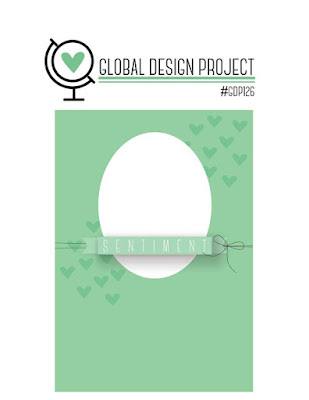 Hope you like this little card and make sure you check out the Global Design Project Blog for their current challenge. Thanks for visiting and hope you are having a great day!! !